This is the golden and final opportunity for each meritorious person to sponsor a total of 67 Dhammakaya Images. Each sponsor will receive the special crystal Buddha Image as the Buddha Image for the family. The Image will serve as a reminder of your contribution to the Cetiya. And on this Visakha Puja Day, Tuseday, May 17, B.E. 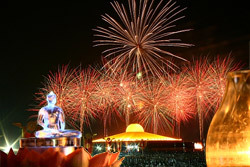 2554, you‘ll have the opportunity to hold your crystal Buddha Image while you circumambulate the Great Dhammakaya Cetiya on our Lord Buddha’s special day. Whoever has not sponsored his personal Dhammakaya Images, this will be the last opportunity to do so. For more infromation, call +662-831-1000. The Great Dhammakaya Cetiya is the Triple Gem Cetiya.